Welcome back to the capsule wardrobe process. If you need a reminder, first we looked at how to find your personal style, and then how to purge your current wardrobe to match your personal style and make room for your capsule wardrobe. 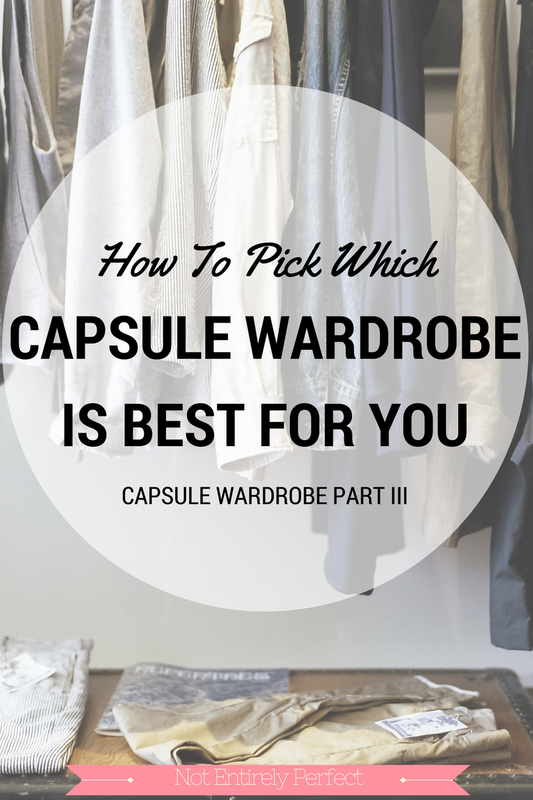 Today, we're looking at some different types of capsule wardrobes out there so you can figure out all the possible ways you could go in your own closet. And I'll talk about what worked for me in particular. The No Brainer Wardrobe is the capsule wardrobe plan from blogger Hayley Morgan. If you're overwhelmed by clothes and have no idea what your style is or what you want it to be, this is really the best option to start with. Hayley believes that you should be able to pick an outfit in well under 10 minutes, every day, spending no time thinking about what you'll wear and spending that brain power on more important activities first thing in the morning, which I think is the most rewarding part of a capsule wardrobe so we're on the same page. 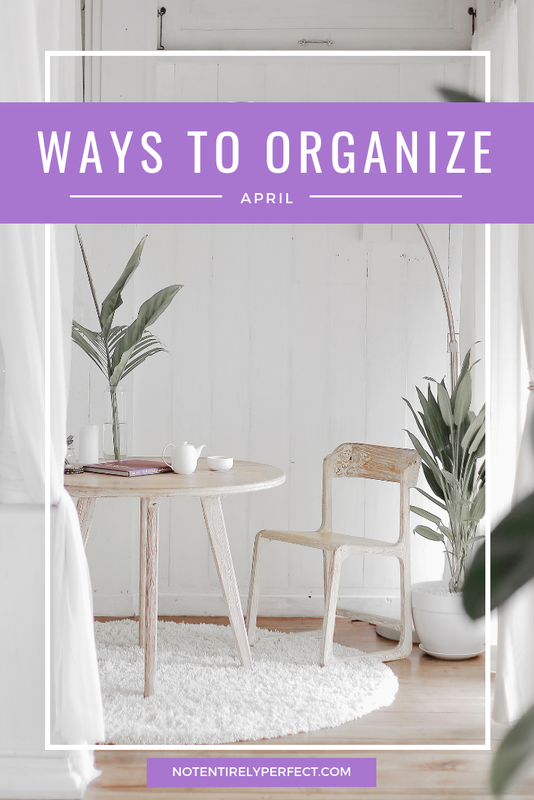 In her plan, she suggests having between 60 and 70 items in your wardrobe which she divides into 3 sections that you should have starting with basic pieces and then adding detail with 'additions' and 'finishers.' In the e-book she talks about what will work for different body types and what would be appropriate for a business environment. Even how to shop at thrift stores. It's a quick and easy read while still covering a lot of details and the system has a good amount of structure to it, but with 60 to 70 items you really don't feel super constricted. Project 333 is probably one of the most popular and well known options and if you've searched around a bit for capsule wardrobes, you've probably seen it pop up a lot. Simply put, this system is about picking 33 items that you wear for 3 months at a time, and therefore you'd end up with 4 seasonal capsules and potentially 132 items, but you'll most likely use many of the items across all the seasons (since it includes jewelry, shoes, and outerwear), making that overall number much lower. This is a really practical option for people who think they can't make a capsule work because they experience drastic seasonal weather changes, as we do here in Chicago. Plus, since it's so popular, you can find tons of examples from other blogs out there. It's also comforting for some people that you don't have to get rid of anything right away, you just bag up and move whatever you're not using in those 3 months and you see how you do with your 33 pieces. It's free online, the website will outline all the rules for you, so no need to buy an e-book. If you've struggled with the capsule idea because of seasons, or if you feel like you want to stretch yourself creatively (you really need to think about whether that patterned skirt matches enough tops that you picked! ), this is ideal for you. The T-Shirt and Jeans Handbook is an e-book on Amazon and it's exactly what it sounds like - making a wardrobe out of jeans and a t-shirt. 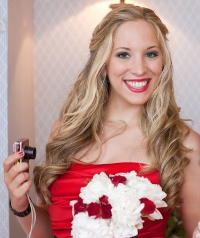 The author shows you how to accessorize it and make it look classy. I recommend this one because some people just swear they are jeans and t-shirt people and then feel weird when they wear that outfit to something they feel they should be more dressed up for. This way, you can learn how to still wear what you love but not feel frumpy and under-dressed all the time. It's basically the 'it's okay to be casual' handbook. The 30 Piece Wardrobe is probably where I got my initial inspiration to massively downsize my closet. Her list (and she does have a downloadable checklist, I love a good checklist) gives an outline of the 30 pieces you need for your year round capsule. It doesn't include shoes in that number, and technically, there are a few tops here and there where you'd swap a short sleeve for a long sleeve, bringing your overall number up over 30. Nonetheless, it's a fantastic way to seriously cut numbers in your closet and embrace minimalism. 1. First of all, I divided the seasons in half. Not 4, like the 333 project, because I just use layers in spring and fall and it works out. So I concentrated on summer clothes versus winter clothes. 2. Once I knew I'd split it that way, I divided my life in half. Since I work in a law firm, my work wardrobe is significantly more dressy than my weekend and after work wardrobe. I'm actually completely fine with those areas not overlapping. Work clothes are just too restricting for my weekend activities and I just want to be more comfortable when I'm relaxing. So my pieces were going to be 'summer work clothes,' 'summer weekend clothes,' 'winter work clothes,' and 'winter weekend clothes.' This is still how I categorize everything in my closet and what I think about when I pick out new pieces. 3. From there, I figured out how many outfits I'd need. In one week, for example, I need at least 4 work outfits (Fridays are casual in my office) and at least 3 weekend outfits. I left pajamas and workout clothes off the table for this part and just thought about what I would wear, each day, until I came home and changed into PJs. If I didn't want to repeat outfits, I'd need 14 total options for a 2 week period. You'll remember from the post where I laid out all my pieces that I don't actual care about wearing the same thing the next week, so 7 per week is my basis and I can add from there if I feel like I want to change it up more often. It's all about picking the right strategy for you. If you can jump in and do your own system like I do then that's great, but it's also great if you're just starting out and prefer something with some more guidelines, like one of the systems I mentioned. The more you practice, the more your capsule will evolve into something that's uniquely yours. Next week, how to buy the right pieces for your capsule, on a budget. See you then.